I haven't been blogging much lately (for one reason or another) and I do sincerely miss it so I decided to make some time in my seemingly insanely busy life to wish you guys a happy Christmas! I had planned a whole set of twelve reads for the "twelve nights of Christmas", but I am neither supposed to know nor do I happen to know when these nights start or end. So I just read a lot of other books along with a few Christmas-ey reads this month. 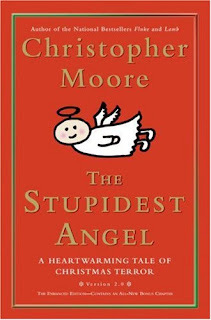 One of the books I read and loved was The Stupidest Angel by Christopher Moore. After reading the likes of Heinrich Boell and Max Frisch in November, this laid-back Christmas story was more than welcome - for getting out of the serious-literature-mode and into the holiday spirit! While looking for some good Christmas reads, among the usual Dicken's A Christmas Carol, Tolstoy's Papa Panov's Special Christmas, in a list titled Christmas Horror I spotted that little cartoon angel, who made me want to read the book in the first place - and also wonder whether the book was in the right list! I loved the book - so much, in fact, that I spend the next day reading two more just-as-funny books by Moore! It is Christmas time in the fictional town of Pine Cove. An angel (a very silly one) is supposed to grant a lucky boy one wish. The little boy has seen Santa die (well, someone dressed up as Santa, but the boy doesn't know that, does he?) The wish goes awry, and instead of making Santa alive again, the angel manages to raise a graveyard full of people from the dead - making it a very zombie Christmas! Only last Wednesday I read a short story called The Festival by H. P. Lovecraft, that I forgot to post about. A man returns home for Christmas, to the little village of Kingsport to meet his folks. Instead he is greeted by strangely silent streets and crazy people. This story is one of the first short stories of Lovecraft's Cthulu Mythos. The strange rites performed in the caves and the old battered and scary grimoire of Necronomicon do make me want to read so much more of Lovecraftian horror - which I hear it's called! What about the Review of 11/22/63? It's a lot more detailed than I thought I'd write it and it's taking a lot of time! Still in my drafts, I'll post it in a couple of days! :) Thanks for stopping by! Merry Christmas!!! (though a bit belated). Christmas zombies? Sounds like a movie plot of Quentine Tarantino. They are funny zombies, if that makes it seem any less like a Tarantino movie. It's a good book, really quite funny! Those are some great picks for the holiday season...Hope you had a gr8 christmas...Happy Holidays!